Scout B. 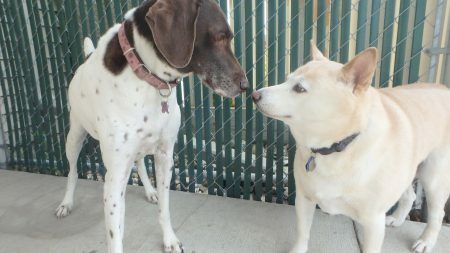 (German shorthaired pointer) may seem like she is being nosy with Sheba P. (shiba inu), but she’s just coming in close to wish Sheba a Happy 7th Birthday! These girls are much more delicate than Cashew and Motley in the previous post. No big sloppy kisses here. Just a sweet nose touch between girl friends says it all.